Institute a top-to-bottom review of USAID’s sector- and country-based activities based upon program effectiveness, allocation of USAID resources, alignment with partner priorities, and national security implications. Commit to implement a comprehensive reform agenda based upon the review’s findings. Provide USAID budgetary and policy primacy over areas in which the agency demonstrates efficacy and focuses its programmatic and staff resources. This paper offers a blueprint for an agency-wide review of USAID’s strengths and weaknesses. The proposal recognizes that a modernized USAID should position itself to better complement the additional estimated $116 billion in global development assistance from other countries and multilateral institutions, as well as private investment, remittances, and recipient countries’ domestic revenues. The assessment must also contend with two constraints on USAID programs: congressional directives and ongoing US presidential initiatives. The proposed review would lay the analytical foundation for driving future reform efforts and for ensuring that USAID remains fit for purpose, maximizes development impact, and delivers strong US taxpayer value over the coming decade. Several changes and trends on the macro level have important implications for where and how USAID operates. These trends include (1) a declining number of poor, developing countries; (2) the availability of other development resources; and (3) the importance placed upon private investment. First, there are significantly fewer poor countries globally. In 1995, there were more than 120 low-income or lower-middle-income countries in the world. Today, that number has fallen to slightly more than 80 countries. In addition, natural resource discoveries and windfalls may lead to further declines in the number of poor countries over the next decade. Second, government revenues have increased sixfold in developing countries since 2000, including a fourfold expansion in Sub-Saharan Africa from $87 billion to more than $350 billion (see figure 1). This increase has greatly expanded partner countries’ ability to invest in social-service delivery, public security, and physical infrastructure. 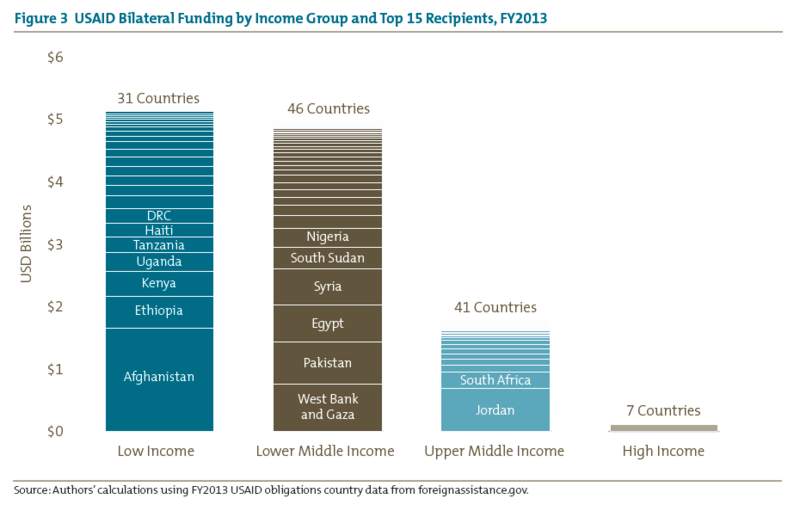 Moreover, USAID assistance is increasingly dwarfed by private remittances, foreign direct investment, and philanthropic flows from the United States and other countries. Despite this, several poor countries, such as Liberia and Afghanistan, will continue to rely on foreign aid to address pressing needs. Despite the increase in revenues, revenue mobilization ratios in several large US foreign aid recipients remain woefully low. For instance, Nigeria has the fourth lowest revenue base in the developing world (11 percent of gross domestic product), followed by Bangladesh (11 percent), Pakistan (13 percent), and Ethiopia (16 percent). These four countries alone could generate nearly $150 billion in additional government revenues if their collection rates matched the developing country median, which is 56 times more than the total US aid to these countries in 2012 ($2.6 billion). This finding demonstrates the potential upside of providing targeted assistance to help countries improve their tax administration regimes and strengthen citizen-government social contracts over time, as opposed to using US taxpayer resources for direct service delivery. Third, foreign government partners are increasingly focused on attracting private investment, especially in infrastructure and productive sectors. Nearly every national development strategy includes a strong emphasis on attracting private investment for physical infrastructure (e.g., electricity and transport) or labor-intensive sectors such as agriculture, services, and manufacturing. This reflects the political imperative of establishing more inclusive economic opportunities in the near and medium term for rapidly expanding working-age populations in many regions. The rapid pace of global change raises the question: are USAID’s programs fit to address today’s development challenges and promote US strategic priorities? This question has long sparked contentious debate. If we assume that the answer is no, a more interesting dichotomy emerges. Should a new administration and Congress work to reform USAID into a development agency for the 21st century? Or should they simply focus the agency on emergency response and humanitarian issues while other entities assume greater responsibility for addressing emerging development challenges? We argue that the former course of action is possible and preferable. A new administration and Congress offer the opportunity to undertake this reform, which could be guided by the findings of a mandated comprehensive review of USAID’s efficacy. While there have been several congressional efforts, the executive branch has undertaken only two public, comprehensive reviews of the agency’s programming since its inception. In 1969, President Richard Nixon commissioned a full review of aid programs, known as the Peterson Commission. The Peterson Commission proposed reorganizing USAID into three parts that would focus on economic growth in low-income countries, development innovation, and security assistance. Although the restructuring never occurred, the review and subsequent proposal marked the first serious attempt at cataloguing the purpose and efficacy of US assistance programs. In 1987, then-USAID administrator Alan Woods led a second attempt to review and reform the agency’s development programs. The Woods Report evaluated USAID activities through an economic growth lens, arguing that agency programs failed to support the macroeconomic reforms that were necessary for successful and sustainable development outcomes. Though the report avoided specific policy prescriptions, it did call for an overhaul of the 1961 Foreign Assistance Act. As with the Peterson Commission, the Woods Report was not translated into concrete reform initiatives. The Quadrennial Diplomacy and Development Review (QDDR) is the closest, most recent approximation to a review of agency programming. Initiated in 2010 by then-Secretary of State Hillary Clinton, the QDDR reviewed the mission, mandate, and operations of the State Department and USAID. The review focused on organizational structures and reforms that would improve the US foreign policy apparatus. While the QDDR has led to several important reforms, it is not a comprehensive review of USAID development activities, and it does not provide recommendations for where and how the agency should focus its scarce human and financial resources. Over the past decade, USAID has undertaken a series of reforms to improve programmatic effectiveness. First, USAID implemented a multiyear effort that was designed to restaff and match its personnel needs with its existing development activities. Despite a relatively flat programmatic budget since 2010, USAID has increased its technical and economic expertise to historic levels, reversing the steep reductions in technical and operational personnel that had occurred during the 1990s and early 2000s. This personnel restoration began during the George W. Bush administration and continued under the Barack Obama administration, with each advancing bold plans to rebuild the agency’s hollowed-out capacity. More specifically, the previous two USAID administrators implemented the Development Leadership Initiative (DLI), which focused on doubling USAID’s workforce by 2012. Under DLI, and with congressional support, the agency added more than 800 staff, most of whom had a “solid background in their technical backstops.” Partly because of these efforts, USAID is increasingly positioned to serve as an engine of development expertise, rather than a simple contracting pass-through. Under Administrator Rajiv Shah, USAID undertook a series of reforms known as USAID Forward. Enacted in 2010, USAID Forward has sought to (1) return policy and budget capacity to the agency; (2) increase focus on the sustainability of development programs; (3) stress the importance of science, technology, and innovation in addressing difficult development challenges; and (4) develop Country Development Cooperation Strategies in concert with partner governments. By illustration, USAID established the Local Solutions initiative to encourage agency investments in partner-country governments,businesses, and civil society as a way to support sustainable country institutions and implementation capacity. Taken as a whole, USAID Forward reforms have expanded USAID’s technical capacity and expertise to design and execute development programs. USAID has also leveraged its scarce resources to bring in new partners and new streams of development funding. Since 2001, USAID has entered into nearly 1,400 public-private partnerships that have mobilized more than $14 billion for US development priorities, with private partners accounting for three-fourths of the funding. It is difficult to gauge the quality and development impact of these partnerships because of a lack of comprehensive and rigorous evaluations. However, the scale of recent partnerships highlights the agency’s recognition of the increasing importance of private finance for development. Despite these efforts, USAID faces significant challenges in sustaining and increasing its development impact. First, the agency arguably has too many small programs in too many countries. In fiscal year 2013, USAID obligated nearly $12 billion in bilateral funding to 125 countries, ranging from $1.6 billion in Afghanistan to only $6,113 in Malaysia. Overall, the top 10 country recipients accounted for 54 percent of the agency’s total programmatic budget. The smallest 50 recipients accounted for less than 2 percent, or roughly $3.6 million on average. While small, targeted grant programs can be efficient and effective, often they are constrained by high overhead costs and an inability to scale. The agency also provided roughly $2 billion to 48 upper-middle-income and high-income countries, including Brazil, Cyprus, and Serbia. Second, USAID has a mixed record in promoting integrated development approaches because of its sector-focused operations. For more than 50 years, the agency has built a bureaucratic organization and procurement processes that favor stovepiped, issue-based solutions. Attempts at promoting a systemic approach, as with the crosscutting Global Health Initiative, have been unable to overcome bureaucratic inertia. Yet, development agencies increasingly recognize that complex development challenges often require coherent, mutually reinforcing interventions and reforms. Third, USAID has not systematically used tools for data collection, monitoring, and evaluation; nor has it made the information that it does collect fully transparent. For instance, USAID lacks even basic, standardized monitoring and evaluation metrics across all of its country and sector operations, making it impossible to compare project performance at the organization level. The lack of monitoring and evaluation (M&E) and associated reporting is hard to address because of the agency’s heavy reliance on large contractors that are not required to account for, or report on, their subcontractors. In contrast, development entities like the multilateral development banks use harmonized project performance metrics, which are tied to annual portfolio and staff reviews. Moreover, unlike other aid agencies — such as the Millennium Challenge Corporation, World Bank, African Development Bank, and the United Kingdom’s Department for International Development — USAID has yet to fully comply with the global standard for reporting aid activities (the International Aid Transparency Initiative). The Quality of Official Development Assistance (QuODA) assessment confirmed this, with USAID ranking 58th out of 108 donor agencies in its commitment to transparency and learning. Working closely with Congress and other stakeholders, the next US president should launch a top-to-bottom review of USAID and commit to act upon its findings. Part of this commitment would entail consideration of the review’s findings within the broader landscape of US foreign assistance efforts. A review effort could ultimately catalyze comprehensive program reform, as appropriate, early in the new president’s term. Such efforts would build upon the progress of the Bush and Obama administrations’ reform initiatives. The next administration’s global development vision and priorities should frame the actions taken based on the results of the review. Whereas President Obama has prioritized the elimination of extreme poverty, the next president may seek to concentrate programs in fragile and conflict-affected countries or to emphasize economic growth in emerging economies. Regardless of strategic vision, the proposed USAID review should take into account, at a minimum, a range of criteria that reflect aid effectiveness principles and global best practices, as well as US geostrategic realities. We discuss four specific criteria in particular: (1) program effectiveness, (2) allocation of USAID resources, (3) alignment with recipient priorities, and (4) national security implications. USAID should systematically evaluate its development results across countries, sectors, and subsectors. The agency does not have a standardized way to judge the efficacy of development programs across its entire global portfolio. Instead, many regional and functional bureaus have different approaches for designing, implementing, and evaluating program results. USAID will have to develop a standardized approach and train staff to implement it, much like Australia’s Annual Review of Development Effectiveness or the World Bank’s Independent Evaluation Group rating system. A standardized approach is invaluable for determining where the agency performs the best (or worst), as well as how it should adjust operations in the future. While such information currently is not systematically available, the top-to-bottom review should draw upon all existing performance data. The comprehensive assessment should examine where USAID focuses its programmatic resources and personnel. An analysis of resource concentration should especially take into account the large number of relatively small USAID programs around the world. A review of where USAID apportions its budget will be critical for informing future reform trade-offs, such as reallocating resources from programs with some combination of (1) relatively small budgets and high overhead costs and inability to scale, (2) large budgets concentrated in strategic countries that may generate insufficient impact per investment dollar, or (3) substandard performance results. Similarly, the review must scrutinize the agency’s personnel capacity as it relates to size, technical expertise, and programmatic impact to ensure bureaus and missions are appropriately staffed to achieve development outcomes. The top-to-bottom review should assess how well USAID assistance aligns with clearly delineated and prioritized US interests and partner-country priorities. Over the past 15 years, the US government, along with all other major donor countries, has repeatedly committed to align its development activities with country-led strategies, plans, and priorities. This reflects both best practice and practical foreign policy considerations. Yet, the majority of USAID-sector budget decisions still emanate from Washington. The review should map the agency’s programmatic allocations with partner countries’ most pressing priorities, as illustrated by national development strategies, representative citizen surveys, and business surveys. Finally, the comprehensive review should consider US national security interests. In pragmatic terms, the US government often continues programmatic activities with lower development effectiveness because of broader geostrategic concerns. However, national security interests should not be a default criterion that reaffirms every development program in a strategic country (e.g., Afghanistan or Pakistan) or subsector (e.g., transnational crime). Rather, it should function as an additional benchmark upon which to judge development programming that otherwise may not prove as effective, well staffed, or resourced. In doing so, this criterion would force US government officials to make the development case for these so-called strategically important programs. In some cases, the national security criterion may warrant extension or augmentation of development programs; while in other cases, certain programs may best be implemented by a different US or multilateral agency or be halted altogether. Taken together, these four criteria provide a solid foundation for a top-to-bottom review of USAID development programming. They combine development best practices, aid effectiveness principles, and an emphasis on taxpayer value, while also reflecting the practical realities of budgetary limitations and overriding US geopolitical interests. The next presidential administration will certainly adopt additional criteria based on new development priorities and goals for the agency, such as US comparative advantages or gaps in global development support. An understanding of US comparative advantage and how USAID development programs contribute to the broader assistance landscape would further highlight the impact of agency programs around the globe. However, these principles offer a starting point for a thorough review of USAID activities around the globe. Two long-standing dynamics have prevented or constrained fundamental reform and adaptation at USAID: (1) widespread congressional earmarks and directives and (2) the proliferation of presidential initiatives. Both of these constraints represent formidable, but not insurmountable, challenges for the proposed comprehensive review and any subsequent USAID reform efforts. Understanding these distinct political and programmatic constraints will be necessary as the next US president seeks to channel USAID’s core capabilities over the coming years. Since its founding, USAID has grappled with congressional directives about how its programmatic funding should be deployed. Anecdotal evidence suggests that congressional directives account for 90 percent of available program funds in some USAID missions, including Indonesia, Malawi, and Mozambique. The actual size of congressional directives in any given year is uncertain because of the lack of transparent, publicly available reporting. Until 2010, the Congressional Research Service aggregated and disclosed congressional earmarks on an annual basis. Since then, no public or private entity has tracked them comprehensively. Therefore, the proposed review will need to address this information gap by commissioning a report on existing congressional directives. More than 50 years of congressional earmarks and directives have produced a hamstrung agency with limited ability to flexibly respond to partner-country priorities and needs, conduct long-term programming and planning, respond to crisis situations, or address new and emerging priorities. At the very least, Congress could permit more flexibility within existing directives, thus allowing USAID the opportunity to better manage portfolios with local priorities. Every presidential administration and USAID administrator seeks to leave a development legacy, whether in health (President Bush) or food security (President Obama). While priorities and focus areas are natural — and even welcomed — presidential initiatives have multiplied at an increasing pace over the past decade. For USAID, this has meant institutionalizing program areas such as malaria, electricity, women’s empowerment, family planning, and even development innovation. While these initiatives all address important development challenges, they have also become ever-growing administration budget lines that reduce organizational flexibility and responsiveness to emerging needs and priorities. Moreover, they often reflect Washington-based directives instead of partner-country priorities (as noted earlier). In practical terms, the sheer number of operating initiatives means that USAID officials must contend with a host of competing priorities. For example, Tanzania is the recipient of nine ongoing USAID-backed initiatives, such as Feed the Future, the Global Climate Change Initiative, Power Africa, and the President’s Malaria Initiative. Therefore, the proposed top-to-bottom USAID review should account for the ever-growing number of development initiatives, recognizing that any comprehensive reform might work at cross-purposes with individual initiatives. 1 Identify and empower an objective, USAID-led team, and then provide that team with the time and resources to credibly undertake the top-to-bottom review. The team should also include non-USAID stakeholders such as external development experts and former congressional members. 2 Ensure that the team and other senior administration officials work closely with Congress throughout the process, including keeping leadership and relevant committees apprised of interim findings. 3 Commit to act upon the review outcomes in terms of future USAID budget and staffing requests. To incentivize review and reform, the next US president should provide USAID with budgetary and policy primacy within the US government over areas in which the agency demonstrates efficacy and focuses its programmatic and staff resources. This could mean transferring funding from other government agencies, which would reduce US agency fragmentation and reinforce USAID as the lead agency on a specific set of development issues. In functional terms, this budgetary and policy primacy for USAID would require two organizational changes. First, the president should codify recognition that the USAID administrator has the option of participating in, or sending a designated deputy to, any National Security Council discussions related to development policy. Second, the USAID administrator should once again be dual-hatted as the director of the F Bureau at the State Department, with the rank of deputy secretary of state. Such a rank is essential for elevating the USAID administrator’s voice in interagency development policy discussions. World Bank, World Development Report 1995: Workers in an Integrating World (New York: Oxford University Press, 1995). For instance, in Africa, nearly every coastal country, as well as many landlocked countries, has either discovered or is actively exploring for oil and gas deposits. International Monetary Fund, World Economic Outlook Database (Washington: IMF, October 2014). In 2013, the median revenue mobilization rate for all developing countries was 27.1 percent of gross domestic product. For examples, see International Monetary Fund, “Poverty Reduction Strategy Papers” (library), www.imf.org/external/np/prsp/prsp.aspx. Larry Nowels, “Foreign Aid Reform Commissions, Task Forces, and Initiatives: From Kennedy to the Present,” in Security by Other Means: Foreign Assistance, Global Poverty, and American Leadership, ed. Lael Brainard (Washington: Brookings Institution, 2007). US Agency for International Development, Development and the National Interest: U.S. Economic Assistance into the 21st Century, report by the administrator (Washington: USAID, 1989). US Department of State and USAID, Leading through Civilian Power: The First Quadrennial Diplomacy and Development Review (Washington: US Department of State and USAID, 2010). US Department of State and USAID, Enduring Leadership in a Dynamic World: Quadrennial Diplomacy and Development Review (Washington: US Department of State and USAID, 2015). See “What Is the Development Leadership Initiative?” USAID, www.usaid.gov/work-usaid/careers/foreign-service/foreign-service-officer-faq; Connie Veillette and John Norris, Engagement amid Austerity: A Bipartisan Approach to Reorienting the International Affairs Budget (Washington: Center for Global Development and Center for American Progress, 2012). Evaluation of the Development Leadership Initiative (DLI): Final Report, developed for USAID (Alexandria, VA: Federal Management Partners), http://pdf.usaid.gov/pdf_docs/pdacs519.pdf. USAID, USAID Forward: Progress Report 2013 (Washington: USAID, 2013), www.usaid.gov/sites/default/­files/documents/1868/2013-usaid-forward-report.pdf. Casey Dunning, Is Local Spending Better? The Controversy over USAID Procurement Reform (Washington: Center for American Progress, 2013). George M. Ingram, A Data Picture of USAID Public-Private Partnerships: 2001–2014 (Washington: Brookings Institution, October 2014). US Commission on Helping to Enhance the Livelihood of People, Beyond Assistance: The HELP Commission Report on Foreign Assistance Reform (Washington: The HELP Commission, 2007), http://helpcommission.info. Amanda Glassman, “Failure to Launch: A Post-Mortem of GHI 1.0,” Global Health Policy (blog), Center for Global Development, July 2012, www.cgdev.org/blog/failure-launch-post-mortem-ghi-10. Vijaya Ramachandran and Julie Walz, “The Need for More Local Procurement in Haiti” (CGD Policy Paper, Center for Global Development, Washington, 2013). Publish What You Fund, “Aid Transparency Index: 2014 Report,” http://ati.publishwhatyoufund.org/. Nancy Birdsall and Homi Kharas, The Quality of Official Development Assistance (QuODA), 3rd ed. (Washington: Center for Global Development and Brookings Institution, 2014). USAID, “Development Experience Clearinghouse,” https://dec.usaid.gov/dec/home/Default.aspx. “Annual Review of Development Effectiveness,” Australian Department of Foreign Affairs and Trade, February 2014, www.ode.dfat.gov.au/publications/arde.html. An exemplary model is the World Bank’s Independent Evaluation Group’s standardized approach to evaluating project performance. The methodology rates programs annually on a scale of 1 to 6 and includes a series of indicators that cover the quality of projects at entry, during implementation, and ex-post. Veillette and Norris, Engagement amid Austerity. Benjamin Leo, “Is Anyone Listening? Does US Foreign Assistance Target People’s Top Priorities?” (CGD Working Paper 348, Center for Global Development, Washington, 2013). Authors’ conversations with USAID mission directors, 2014. Carol Hardy Vincent and Jim Monke, “Earmarks Disclosed by Congress: FY2008–FY2010 Regular Appropriations Bills” (Washington: Congressional Research Service, 2010), http://nationalaglawcenter.org/wp-content/uploads/assets/crs/R40976.pdf. Some of these efforts, such as President Obama’s Power Africa, align with requests from partner governments and seem to work in concert with USAID plans and national development strategies. Center for Global Development, “US Development Initiatives: Where in the World Are They?” www.cgdev.org/cgd_map.